The Toll-like receptor (TLR) family acts as pattern recognition receptors for pathogen-specific molecular patterns (PAMPs). TLR2 is essential for the signaling of a variety of PAMPs, including bacterial lipoprotein/lipopeptides, peptidoglycan, and GPI anchors. TLR6 associates with TLR2 and recognizes diacylated mycoplasmal lipopeptide along with TLR2. We report here that TLR1 associates with TLR2 and recognizes the native mycobacterial 19-kDa lipoprotein along with TLR2. 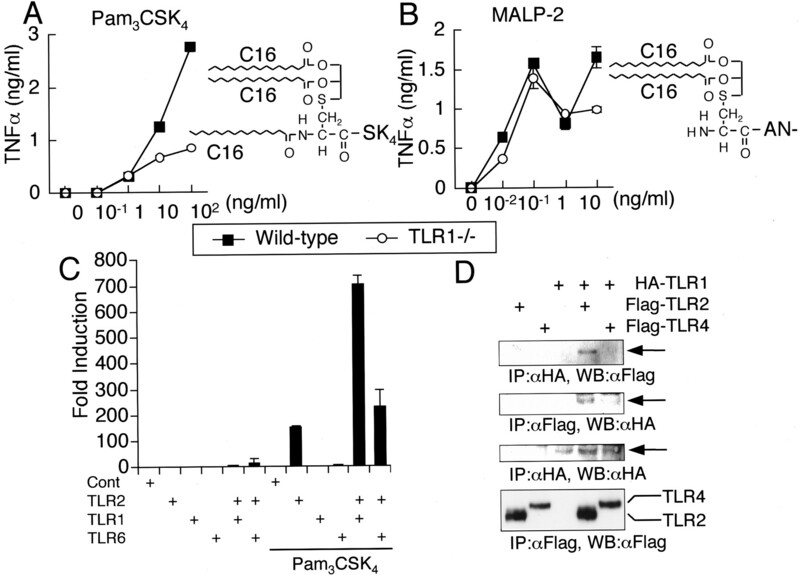 Macrophages from TLR1-deficient (TLR1−/−) mice showed impaired proinflammatory cytokine production in response to the 19-kDa lipoprotein and a synthetic triacylated lipopeptide. 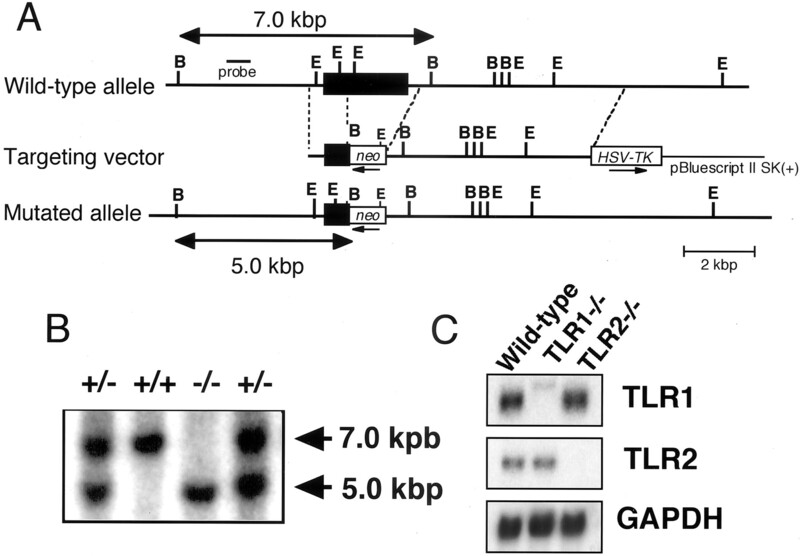 In contrast, TLR1−/− cells responded normally to diacylated lipopeptide. TLR1 interacts with TLR2 and coexpression of TLR1 and TLR2 enhanced the NF-κB activation in response to a synthetic lipopeptide. Furthermore, lipoprotein analogs whose acylation was modified were preferentially recognized by TLR1. Taken together, TLR1 interacts with TLR2 to recognize the lipid configuration of the native mycobacterial lipoprotein as well as several triacylated lipopeptides. The Toll-like receptor (TLR)4 family participates in innate immunity by detecting invading pathogens (1, 2, 3). So far, 10 members of the human TLR family have been discovered. Most of the known TLRs recognize discrete pathogen-associated molecular patterns (PAMPs) to trigger the activation of similar intracellular signaling pathways, leading to the nuclear translocation of a transcription factor, NF-κB. The signaling ultimately culminates in the production of proinflammatory cytokines to evoke host defense responses and alert acquired immunity. Recent studies disclosed the ligands for various TLRs. TLR2 recognizes a variety of bacterial components, such as peptidoglycan (PGN), bacterial triacylated lipoproteins, mycoplasmal diacylated lipoprotein, and GPI anchors from Trypanosoma cruzi (4, 5, 6, 7, 8, 9, 10). TLR4 is essential for responses to LPS, a glycolipid specific to Gram-negative bacterial cell walls. TLR5 is reported to recognize flagellin, a protein component of bacterial flagella. Furthermore, nucleotides specific to pathogens and nucleotide analogs are also detected by TLRs: TLR3, TLR7, and TLR9 participate in the recognition of viral dsRNA, imidazoquinolines, and bacterial DNA with unmethylated CpG motif, respectively (1, 2, 3, 11). There is evidence that TLRs can form heterodimers, which furthers defines their ligand specificity. Notably, TLR6 has a unique property to recognize a mycoplasmal lipoprotein cooperatively with TLR2 (12, 13). TLR6-deficient (TLR6−/−) mice failed to produce proinflammatory cytokines in response to diacylated mycoplasmal lipopeptides, termed macrophage-activating lipopeptide 2 kDa (MALP-2), whereas they responded normally to a triacylated bacterial lipopeptide. TLR2−/− macrophages did not respond to either of these lipopeptides (13). These observations indicate that TLR6 discriminates a subtle difference in the acylation of lipopeptides derived from microbial pathogens. Furthermore, these findings raised the possibility that TLR2 forms a heterodimer with a different TLR to recognize other PAMPs, in particular triacylated lipopeptides. TLR1 shows high similarity with TLR6 (14). It was reported that overexpression of TLR1 inhibited the TLR2-mediated responses to phenol-soluble modulin secreted from Staphylococcus epidermidis (15). On the other hand, another report showed that TLR1 participates in the recognition of soluble factors released from Neisseria meningitides (16). However, the ligand of TLR1 in vivo is yet to be clarified. In the present study, we generated TLR1−/− mice and analyzed the role of TLR1 in the recognition of bacterial lipopeptides. A genomic clone containing mouse TLR1 was isolated from the 129Sv murine genomic library (Clontech Laboratories, Palo Alto, CA). A targeting vector was designed to replace a portion of an exon containing aa 575–795 of the mouse Tlr1 gene with a neo cassette flanked by 1.0 kb of the 5′ genomic fragment and 10 kb of the 3′ genomic arm. An HSV-tk cassette flanked the 3′ genomic arm. A targeting vector was linearized with SalI and introduced into E14.1 embryonic stem (ES) cells. We screened 125 of G418- and gancyclovir-resistant clones for homologous recombination by PCR and confirmed by Southern blot analysis. Three ES clones were correctively targeted and were injected into C57BL/6 blastocysts. The chimeric mice were bred to C57BL/6 females to obtain F1 offsprings. TLR1−/− mice were obtained by intercrossing heterozygotes. TLR1−/− mice and their wild-type littermates from these intercrosses were used for experiments. TLR2−/− mice were generated by gene targeting as described previously (7). The Mycobacterium bovis bacillus Calmette Guérin (BCG) was purchased from Kyowa (Tokyo, Japan). The native Mycobacterium tuberculosis 19-kDa lipoprotein was purified as described elsewhere (4). A synthetic N-palmitoyl-S-dipalmitoylglyceryl (Pam3) Cys-Ser-(Lys)4 (CSK4) and MALP-2 were as described previously (5, 8). A synthetic lipoprotein analog, JBT3002, is as described previously (17). Other lipopeptides carrying different N-terminal acyl functions such as N-palmitoyl-S-dilaurylglyceryl (N-Pam-S-Lau2) CSK4, N-lauryl-S-dilaurylglyceryl (Lau3) CSK4, and N-myristyl-S-dimyristylglyceryl (Myr3) CSK4 were synthesized by the Peptide Institute (Osaka, Japan). Mice were injected i.p. with 2 ml of 4% thioglycolate (Difco, Detroit, MI). Three days later, peritoneal exudate cells were isolated from the peritoneal cavity. Then the cells were cultured for 2 h and adherent cells were used as peritoneal macrophages. Peritoneal macrophages (5 × 104) were cultured in RPMI 1640 medium (Nacalai Tesque, Kyoto, Japan) supplemented with 10% FCS and were stimulated with indicated bacterial components for 24 h. Concentration of TNF-α (Genzyme Techne, Minneapolis, MN) and IL-6 (R&D Systems, Minneapolis, MN) in culture supernatants were determined by ELISA. Human TLR1 tagged with hemagglutinin (HA) at the carboxyl terminus was generated by PCR and ligated into the expression plasmid pEF-BOS. pFLAG-TLR2 and pFLAG-TLR4 were as described previously (13). Human embryonic kidney (HEK) 293 cells were transiently transfected with indicated vectors along with a pELAM luciferase reporter plasmid (18) and a pRL-TK (Promega, Madison, WI) for normalization of transfection efficiency by Lipofectamine 2000 (Invitrogen, San Diego, CA). Twenty-four hours after transfection, the cells were stimulated with 10 ng/ml Pam3CSK4 for 8 h. Then the cells were lysed and luciferase activity was measured using the dual-luciferase reporter assay system (Promega) according to the manufacturer’s instruction. To investigate the functional role of TLR1, the mouse Tlr1 gene was disrupted by homologous recombination in ES cells. A targeting vector was constructed for the deletion of a part of exon containing aa 575–795 of the mouse Tlr1 gene (Fig. 1⇓A). This portion corresponds to a transmembrane and cytoplasmic region of TLR1. Chimeric males were crossed to C57BL/6 and F1 heterozygous offspring were obtained. Intercrosses of these heterozygotes gave rise to homozygotes deficient in Tlr1. The targeted disruption of the Tlr1 gene was confirmed by Southern blotting of genomic DNA (Fig. 1⇓B). Peritoneal macrophages from TLR1−/− mice did not express TLR1 mRNA (Fig. 1⇓C). In contrast, the expression of TLR2 mRNA in TLR1−/− macrophages was normal compared with that in wild-type cells. TLR1−/− mice grew healthy, fertile, and did not show any obvious abnormalities for up to 6 mo. Lymphocyte populations in thymocytes and splenocytes were not altered in TLR1−/− mice (data not shown). Establishment of TLR1-deficient mice. A, A mouse TLR1 genomic locus and the targeting vector. A filled box denotes a coding exon. Restriction enzymes: B, BamHI, E, EcoRI. B, Southern blot analysis of genomic DNA extracted from mouse tails digested with BamHI. DNA was electrophoresed, transferred to nylon membrane, and hybridized with the radiolabeled probe indicated in A. C, Northern blotting analysis of thioglycolate-elicited peritoneal macrophages. Total RNA (10 μg) was electrophoresed, transferred onto nylon membrane, and hybridized with a cDNA probe for TLR1. The same membrane was rehybridized with that for TLR2 and GAPDH. To screen the components recognized by TLR1, we first examined the cytokine production from TLR1−/− macrophages in response to a variety of PAMPs purified from bacteria. These include the native 19-kDa lipoprotein purified from M. tuberculosis, LPS from Salmonella minnesota Re595, and PGN from Staphylococcus aureus. Thioglycolate-elicited peritoneal macrophages from wild-type and TLR1−/− mice were cultured in the presence of these PAMPs for 24 h, and the concentration of TNF-α in culture supernatant was measured. In response to the 19-kDa lipoprotein, wild-type macrophages produced TNF-α in a dose-dependent manner. 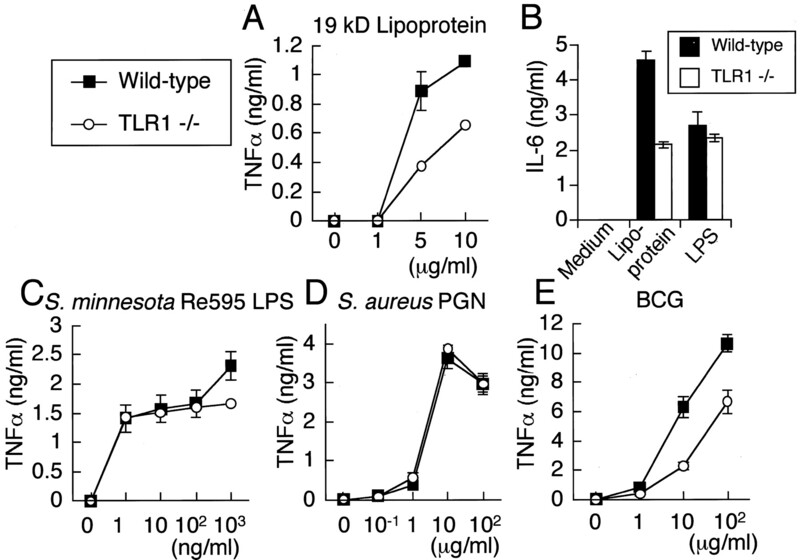 In contrast, the production of TNF-α from TLR1−/− macrophages was markedly impaired for each concentration of lipoprotein tested (Fig. 2⇓A). The production of IL-6 in response to the lipoprotein was also reduced in TLR1−/− macrophages compared with that of wild-type cells (Fig. 2⇓B). When stimulated with LPS and PGN, TLR1−/− macrophages produced TNF-α in a dose-dependent manner to almost the same extent as wild-type cells (Fig. 2⇓, C and D). We next examined whether TLR1 is involved in the recognition of whole mycobacteria. Peritoneal macrophages were cultured with increasing amounts of live M. bovis BCG for 24 h, and the concentration of TNF-α in culture supernatant was measured. As shown in Fig. 2⇓E, the ability to produce TNF-α in response to BCG was partially impaired in TLR1−/− macrophages. These results indicate that TLR1 is involved in the recognition of the 19-kDa lipoprotein purified from mycobacteria as well as live mycobacteria. Impaired TNF-α production in response to the mycobacterial 19-kDa lipoprotein in TLR1-deficient macrophages. A, C, D, and E, Peritoneal macrophages (1 × 105) prepared from wild-type and TLR1−/− mice were stimulated with increasing concentrations of 19-kDa lipoprotein purified from M. tuberculosis (A), live M. bovis BCG (C), S. Minnesota Re595 LPS (C), S. aureus PGN (D) and live M. bovis BCG (E) for 24 h. Then TNF-α concentration in the culture supernatant was measured by ELISA. Data are shown as the mean ± SD of triplicate wells and are representative of three independent experiments. B, IL-6 concentration was measured in the culture supernatant of wild-type and TLR1−/− macrophages stimulated with 1 μg/ml 19-kDa lipoprotein and 100 ng/ml LPS. Data are shown as the mean ± SD of triplicate wells. Lipoproteins are produced by a variety of pathogens including mycobacteria, Gram-negative bacteria, and Mycoplasma species (19). The N-terminal acylated lipopeptide region is responsible for the immunostimulatory activity of bacterial and mycoplasmal lipoproteins. Bacterial and mycoplasmal lipoproteins differ in the degree of acylation of N-terminal cysteine. Lipoproteins of bacteria are triacylated, whereas those of mycoplasma are diacylated (20). Synthetic lipoprotein analogs consisting of a palmitoyled version of N-acyl-S-diacyl cysteine and S-diacyl cysteine mimic the immunostimulatory activity of bacterial and mycoplasmal lipoprotein, respectively (21, 22). We have previously shown that TLR2 is essential for both tri- and diacylated lipopeptide response and TLR6 specifically recognizes diacylated lipopeptide in conjunction with TLR2 (13). Cytokine production in response to the 19-kDa lipoprotein preparation was abrogated in TLR2−/− macrophages (23). All of these results suggested that TLR1 also cooperates with TLR2 to recognize triacylated lipoprotein. To clarify the chemical structure recognized by TLR1, we stimulated peritoneal macrophages from wild-type and TLR1−/− mice with the synthetic bacterial lipopeptide Pam3CSK4, and synthetic mycoplasmal diacylated MALP-2. TLR1−/− macrophages showed significantly impaired TNF-α production in response to Pam3CSK4 compared with wild-type cells, whereas TLR1−/− cells responded normally to MALP-2 (Fig. 3⇓, A and B). These results indicate that TLR1 is involved in the recognition of triacylated bacterial lipoprotein. In addition, TLR1 and TLR6 differentially recognize TLR2 ligands, distinguishing the degree of acylation of the lipopeptide. Involvement of TLR1 in synthetic bacterial lipopeptide recognition. A and B, Peritoneal macrophages (1 × 105) from wild-type and TLR1−/− mice were cultured with increasing concentrations of Pam3CSK4 (A) and synthetic MALP-2 (B) for 24 h. Then the concentration of TNF-α was measured. Data are shown as the mean ± SD of triplicate wells and are representative of three independent experiments. C, HEK293 cells were transiently cotransfected with control vector, TLR1, TLR2, and TLR6 expression vectors plus pELAM-luc reporter plasmid. After 24 h, the cells were stimulated with 10 ng/ml Pam3CSK4 for 8 h, and the cell lysates were assayed for luciferase activity. D, HEK293 cells were transiently transfected with the indicated combination of expression vectors for 4.0 μg/ml Flag-TLR2 or Flag-TLR4, and 6.0 μg/ml HA-TLR1. Total amount of plasmid DNA was kept constant with 10 μg by supplementing with empty vector. Thirty-six hours after transfection, the cells were lysed, immunoprecipitated with anti-Flag or anti-HA Ab (IP), and subsequently immunoblotted with anti-Flag or anti-HA Ab (WB) as indicated. To further investigate whether the coexpression of TLR1, TLR2, and TLR6 results in the modulation of NF-κB activity in response to lipopeptide stimulation, HEK293 cells were cotransfected with TLR1, TLR2, and TLR6 expression vectors along with pELAM-luciferase reporter plasmid. Transfected cells were stimulated with 10 ng/ml Pam3CSK4 for 8 h, and luciferase activity was measured. As shown in Fig. 3⇑C, the expression of TLR2 conferred the NF-κB activation in response to Pam3CSK4 stimulation and coexpression of TLR1 significantly enhanced the activation. In contrast, coexpression of TLR6 and TLR2 did not augment the NF-κB activation induced by Pam3CSK4 stimulation. These results indicate that TLR1 and TLR2, but not TLR6, are involved in the cooperative recognition of Pam3CSK4. We then examined whether TLR2 and TLR1 interact in mammalian cells. HEK293 cells were cotransfected with Flag-tagged TLR2 or TLR4 and HA-tagged TLR1. Immunoprecipitation of HA-tagged TLR1 resulted in coprecipitation of Flag-tagged TLR2, but not of TLR4 (Fig. 3⇑D). Reciprocally, HA-tagged TLR1 also coprecipitated with Flag-tagged TLR2. However, stimulation with Pam3CSK4 did not affect the extent of association between TLR1 and TLR2 (data not shown). These results suggest that TLR1 and TLR2 associate in a ligand-independent manner in HEK293 cells. Although the response to Pam3CSK4 was significantly impaired in TLR1−/− mice, we can still observe TLR1-independent cytokine production. Since TLR1 and TLR6 discriminate subtle differences in the lipid moiety of lipopeptides, we hypothesized that there are some other ligands recognized by TLR1 more preferentially and that the configuration of lipid moiety is critical for the involvement of TLR1. To further screen the specific ligands recognized by TLR1, we synthesized lipopeptides bearing different combinations of fatty acids at their N terminus. These include Myr3CSK4, Lau3CSK4, N-Pam-S-Lau2CSK4, and a lipoprotein analog used for anticancer therapy, JBT3002 (17) As shown in Fig. 4⇓, they differ in the length of fatty acids substituted on the N-terminal cysteine of the peptides. The lipid moiety of N-Pam-S-Lau2CSK4 and JBT3002 are the same. We stimulated macrophages from wild-type, TLR1−/−, and TLR2−/− mice with these compounds and measured TNF-α production. All of these synthetic lipopeptides activated wild-type cells to produce TNF-α in a dose-dependent manner (Fig. 4⇓). Macrophages from TLR2−/− mice did not produce any detectable TNF-α in response to either of these lipopeptides. 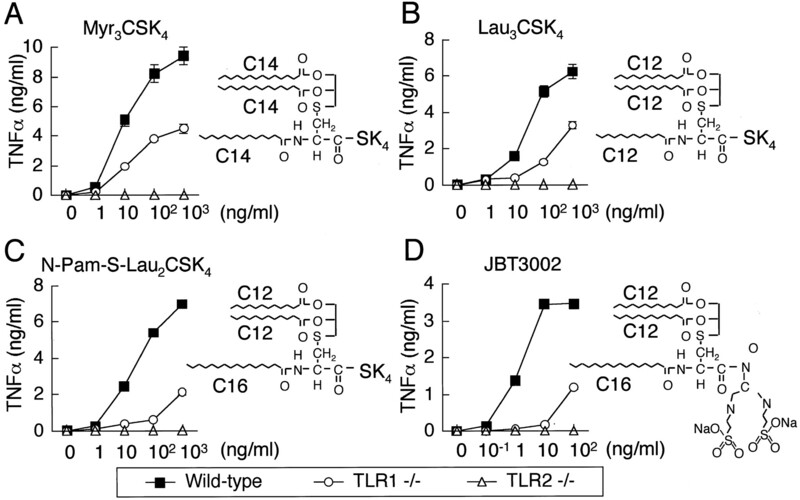 The ability of TLR1−/− cells to produce TNF-α was also impaired in response to Myr3CSK4 and Lau3CSK4 (Fig. 4⇓, A and B). Interestingly, when stimulated with N-Pam-S-Lau2CSK4 and JBT3002, the production TNF-α of was profoundly defective in TLR1−/− cells, indicating that a subtle difference in lipid moiety of lipoprotein is critical for the TLR1 requirement (Fig. 4⇓, C and D). Differences in the lipoylation altered TLR1 responsibility. Peritoneal macrophages (1 × 105) from wild-type, TLR1−/−, and TLR2−/− mice were stimulated with increasing concentrations of Myr3CSK4 (A), Lau3CSK4 (B), N-Pam-S-Lau2CSK4 (C), and JBT3002 (D) for 24 h. Then the concentration of TNF-α was measured. The results are shown as the mean ± SD of triplicate wells and are representative of three independent experiments. In summary, the present study provides evidence that TLR1 is involved in the recognition of triacylated lipoproteins as well as mycobacterial products. TLR1 and TLR2 cooperate to detect Pam3CSK4 by interacting in each other, indicating that TLR2 pairs with TLR1 or TLR6 to recognize different PAMPs. However, it is still unknown whether TLR2 forms a heterodimer with other TLR or whether there exists a large receptor complex consisting of TLR1, 2, 6, and others. Further studies will clarify the exact components of the receptor complex. In addition, the response to PGN was not abrogated in either TLR1-or TLR6-deficient mice. It is possible TLRs other than TLR1 and TLR6 pair with TLR2 to recognize PGN or TLR2 alone may be sufficient to detect it. Since TLR10 is highly homologous to both TLR1 and TLR6, it is also a candidate to form a pair with TLR2 to recognize PGN (24). Finally, N-palmitoyl-S-lauryl lipopeptide and its analog were preferentially recognized by TLR1. Although the structural basis for the TLR1 requirement remains unclear, these compounds are useful to study the specific role of TLR1 in vivo. Investigations pursuing TLR1-specific agonists/antagonists may give us a new strategy to design adjuvants and treatments for disease in which triacylated lipoproteins are involved in pathogenesis. We thank E. Horita for excellent secretarial assistance and N. Okita for excellent technical assistance. ↵1 This work was supported by Special Coordination Funds of the Ministry of Education, Culture, Sports, Science and Technology, from the Japanese Government. ↵2 Current address: Department of Cancer Immunology and AIDS, Dana-Farber Cancer Institute, One Jimmy Fund Way, Boston, MA 02115. ↵4 Abbreviations used in this paper: TLR, Toll-like receptor; PGN, peptidoglycan; PAMP, pathogen-associated molecular pattern; MALP-2, macrophage-activating lipopeptide 2 kDa; ES, embryonic stem; BCG, bacillus Calmette Guérin; HA, hemagglutinin; HEK, human embryonic kidney; Pam3, N-palmitoyl-S-dipalmitoylglyceryl; N-Pam-5-Lau2, N-palmitoyl-S-dilaurylglyceryl; Lau3, N-lauryl-S-dilaurylglyceryl; Myr3, N-myristyl-S-dimyristylglyceryl; CSK4, Cys-Ser-(Lys)4.